Asuper-powerful camera orbiting Mars may help discover the fate of long-lostspacecraft that never phoned home after reaching the red planet. NASA'sMars Reconnaissance Orbiter (MRO) is now circling that puzzling world, equippedto assist in determining whether life ever arose on the red planet andcharacterize its climate and geology, as well as prepare for futureexpeditionary crews to land there. Butanother sharp-shooting skill of MRO is catching sight of past probes--craft thatran into trouble and died in the line of Mars duty. That includes NASA's gonebut not forgotten Mars Polar Lander and the British-built Beagle 2. MROis outfitted with an array of equipment, including the High Resolution ImagingScience Experiment (HiRISE) camera--built to provide the most detailed view ofMars' surface to date. From Mars orbit, MRO can take zoom-in images of objectson the surface of the planet, checking out features that are about the size ofa small dining room table. NASA'sMars Polar Lander was shot toward the red planet in January of 1999, only to belost on December 3 that same year as the probe neared its south poleexploration target. What truly happened to the craft and its exact whereaboutsremain best guesses. Aninvestigation of the loss concluded that the most probable cause of the failurewas due to the generation of bogus signals when the craft's legs were deployedhigh above the martian landscape. Those spurious signals are thought to haveproduced a false indication that the spacecraft's outstretched legs hadactually reached Mars. Thatmisread of its true altitude may have resulted in Mars Polar Lander prematurelyshutting down its set of descent engines. Then, it is thought, the craft fellto an ugly ending within Mars' south pole region. "We'llsearch for Mars Polar Lander when the lighting conditions are good. Right nowit's too dark down there," said Alfred McEwen, Director of the Planetary ImageResearch Lab at the University of Arizona in Tucson, Arizona. He is MRO's HiRISE principalinvestigator. Asfor when the first opportunity to utilize HiRISE to look for Mars Polar Lander,McEwen told SPACE.com that he hasn't focused on a time frame as yet. "It's a matter of both illumination angle and atmospheric conditions." TheMars Polar Lander site is on the edge of polar night right now, as Mars is notquite half-way through its southern winter, explained Richard Zurek, MRO'sproject scientist at the Jet Propulsion Laboratory (JPL) in Pasadena, California. Zureksaid that even when spring comes again to the southern hemisphere on Mars--February 8, 2007--the seasonal snowsmade largely of carbon dioxide ice will still cover the high southernlatitudes. These won't be gone from the area until the latter part of May ofnext year, he added. "Rightnow, MRO is focusing on the high northern latitudes, providing information forthe Phoenix mission to use in selecting their landing site," Zurek told SPACE.com. 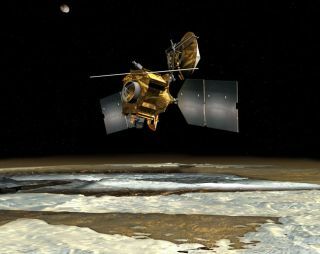 That will be themain focus for MRO until the end of the calendar year, he said, as Mars movesinto late northern winter and observing conditions deteriorate over the northpolar area. NASA's Phoenix lander is to belaunched next year, the first in a series of Scout-class spacecraft. It is alsoa resurrected Mars Polar Lander mission but this time headed for Mars'water-ice-rich northern polar region. Earlynext year the focus will shift to looking at Mars Science Laboratory (MSL)candidate sites, Zurek pointed out. MSL is a hefty wheeled rover to bedispatched to the red planet in 2009. "MROwill look at a few of those even before the end of the year, as southern springand summer are seasons when dust suspended in the atmosphere is more extensiveand opaque," Zurek continued. "Of course, unless there is a planet-encirclingstorm this year, there will still be good seeing over many areas, but localactivity and regional storms introduce a more random element and a more diffusebackground haze. So, MRO will try to get an early look in areas that are moreprone to obscuring dust activity." It'sclear that MRO is going to be one busy bird as Mars researchers hope to workthrough a list of roughly 50 or more Mars Science Laboratory targets prior to alanding site workshop in October 2007. Zureksaid that scientists also hope to snag some early views of the Viking Lander 2site. That NASA spacecraft successfully set down in Mars' Utopia Planitia inearly September of 1976. Doing so will help calibrate interpretations of higherlatitude data being collected for the Phoenix lander mission, he said. "Wealso hope to get back for a second view of Victoria Crater to pair with the onejust taken in order to produce a stereo image before lighting conditions changetoo much," Zurek said. NASA's Opportunity Mars rover has wheeled itself intoposition to begin studies of that large feature. The space agency's otherdoing-just-fine Mars rover, Spirit, is also a likely target - but one that isnot as urgent as some of the other MRO targets on the "to do" list, heobserved. Butfirst, MRO must focus on the near-term needs of Phoenix and Mars ScienceLaboratory, Zurek emphasized. "And second, we should not forget that MRO issupposed to do more than look at places that we already know. It also seeks newplaces that may prove to be even better destinations for future missions and totest our present understanding with new data as we explore more of the diverseplanet that is Mars," he added. Beagle 2 wreckage or ? Similarto the Mars Polar Lander loss was the plight of a British-built Beagle 2 probe.It was deployed from the European Space Agency's Mars Express on December 19, 2003. Mars Expressremains busy at work as it orbits the planet. Beagle2 was targeted to land in Isidis Planitia via parachutes and airbags to cushionits touch down. The probe was a science instrument-packed 152 pound (69kilogram) device that never uttered a peep from the surface of Mars. "Dependingon our success with Mars Polar Lander--and with landers with fairly well-knownlocations--we will eventually try for Beagle 2, but that is a much greaterchallenge due to its smaller size and the greater uncertainty of its landingellipse," Zurek said, noting that his opinions are his own and do not representthe view or policy of JPL. Indeed,it might be a stretch for MRO to spot Beagle 2 as it is only a few feet wide. Latelast year, Beagle 2 wreckage was thought found in imagery relayed from NASA'sMars Global Surveyor - claimed by some to show that the craft came close tosuccess. But others in the Mars photo-interpretation community contend that noincontrovertible evidence exists in imagery to support Beagle 2 beingdiscovered. "MROmay hopefully resolve what happened to Beagle 2," explained Mark Sims, theproject's mission manager at the Space Research Center's Department ofPhysics and Astronomy, University of Leicester in the United Kingdom. MROhas enough resolution to perhaps directly image the lander and certainly enoughto image any debris or components, like airbags, parachutes, etc. That is,assuming that such gear is not covered by dust. Now nearly three years afterBeagle 2's landing, hardware dusted over may no longer be recognizable, Simstold SPACE.com. "Weunderstand that the HiRISE team intends to image the Beagle 2 landing ellipseat some point in the mission," Sims said. However, for obvious reasons, headded, doing so is not a high priority for MRO, given top-of-the-checklist needto image sites for Phoenix, Mars Science Laboratory, and other future missions. "We,however, look forward to what MRO might detect as it would be good to ascertainhow close to a successful landing Beagle 2 came," Sims noted. UsingMRO as a spotter scope for vanished Mars probes is on the schedule. But thespacecraft also totes another "eye spy" device for finding spacecraft goneastray. Alongwith HiRISE, MRO's Compact Reconnaissance Imaging Spectrometer for Mars (CRISM)is now up and operating too. It is able to identify minerals on the surface ofMars and is one of six science instruments aboard MRO. CRISM investigations arebeing led by the Johns Hopkins University Applied Physics Laboratory in Laurel, Maryland. Spacecrafthard landings, like in the case for Beagle 2, can churn up a rather large areaof soil in the process. CRISM might locate signs of different minerals in theupturned crash spot that don't match those of the surrounding terrain. JPL'sZurek said that this kind of CRISM data would be like having a mineralfingerprint pointing to the spot where Beagle 2 plopped down.